I’m hoping this image can stand on its own because I’m sort of at a loss to describe the importance of the ocean. But you already know. Such a beautiful image, Karen…and yes, we should all understand the importance of our oceans…nothing more needs to be said….. Wonderful Image .Thanks for showing Karen,well done. Wow, is that really a photograph? So gorgeous – stands on its own for sure! Beautiful and yes the oceans are essential and so important to us all. our universe. — may be where we came from. I like this somewhat floating feeling this image gave to me. Sooooo important Karen and this is a beautiful image.. I like to think of the ocean as our collective womb. Lovely like calligraphy and petals on the water. I have been sick for years about how we have polluted the ocean and the creatures that depend on it. I have just been admiring the textures of water in a post by Lover of Light http://aloverofthelight.wordpress.com/2013/06/07/winter-sail-off-east-head/ and now I can enjoy the liquidity and patterns in your water image. It’s great looking at other people’s blogs, photography and writing – really enjoy it! Lovely (as are our oceans) – essential to life on earth (no less). Absolutely beautiful Karen! As one who lives near the beach as spends so much time appreciating what it provides I’m happy to see this. Delicate and complex beauty, much like our irreplaceable oceans. Really delightful and such a peaceful image. Such wonderful color and composition. A marvelous tribute to the oceans. Beautiful image – it really captures a feeling of fleeting delicacy. What a beautiful and dreamlike “landscape”. No need to say much, it does indeed stand on its own. Love the colours, the smooth forms and the flowing feeling. Your photographic painting is so very beautiful, Karen. Such transience and fragility and of course permanence. Beautiful. It most certainly can stand alone. As beautiful as ever, Karen. 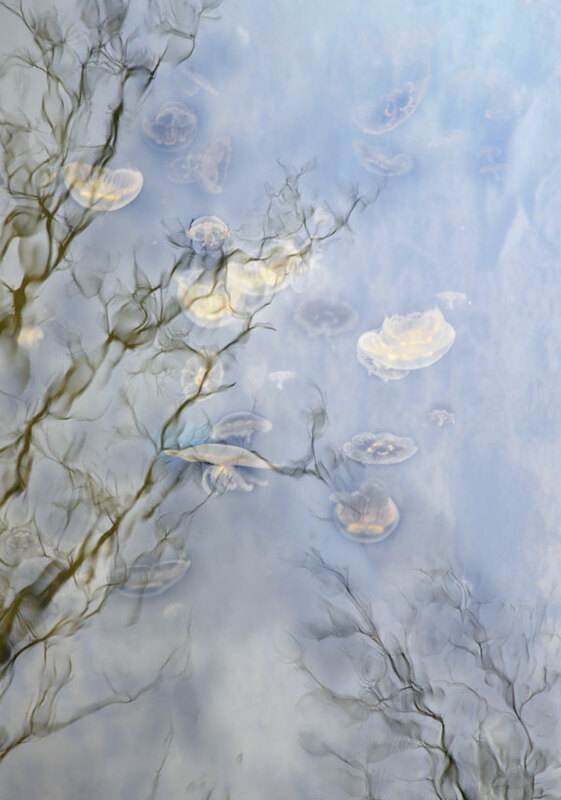 There is so much in this Karen – I can see flowers and jellyfish and much more, disappearing into the depths. A very gentle reminder of the immensity of the ocean. It does indeed stand alone. Thanks for the important post. This photo is pure poetry in image. Wonderfullly beautiful Karen, and thank you for the links. Perfect image for the occasion, Karen. you must have been a mermaid in a previous life. this is a beauty humans don’t normally see. this looks like an impressionist painting, gorgeous!